comfortable Christmas Cabin in Levi! 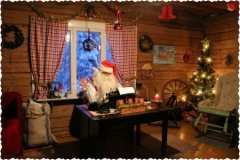 The Christmas Cabin is a place where Santa Claus is relaxing after his busy work. 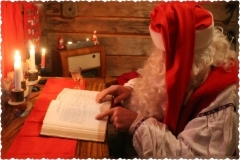 Santa Claus loves to read books and he loves to go ice fishing to the lake near Christmas Cabin. 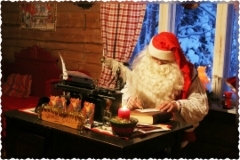 During Christmas time Santa Claus also works in his cabin. and they fly to the countries all over the world. Santa's Christmas Cabin is very nice and comfortable and there is warm open fire inside. Santa has his own bedroom with small library and Mrs Santa has private bedroom as well. Mrs Santa loves to make colourful woolen socks to the elves by herself. The area near Christmas Cabin is wonderful and there is white snow everywhere. The stars are wrinkling in the sky and in the cold winter nights there might be amazing Northern Lights. they are so powerful that the lights start blinking in the cabin.